For this week’s Northern Michigan in Focus, Corey Adkins takes us to the North Light on Grand Island, a very special place to one man. “I love Lake Superior, I love it. I could come here and feel like it must been for centuries, with the exception of the lighthouse building, there’s nothing here,” said Loren Graham. This story starts in 1954 when Loren Graham was trying to win a woman’s heart. “My wife’s family is the oldest family in Grand Island. They started coming here in 1883. I was brought here to the island 1954, sort of on trial, because if I was going to marry the daughter of Pat Albeirt, it was required that I love Grand Island, it was a test to see if I did,” explained Loren. He did, but love wasn’t the problem. At the time, Loren was a professor at MIT and Harvard, he’s also a writer. He wanted a place more secluded than where his wife’s family lived, which is by the south end of Grand Island. He needed a place to write. “I heard there was an old abandoned lighthouse on the north side of the island, eight or 10 miles away from the cabin. At that time there’s no way to get there by vehicle. You had to hike,” said Loren. When he got there he found the Grand Island North Light. 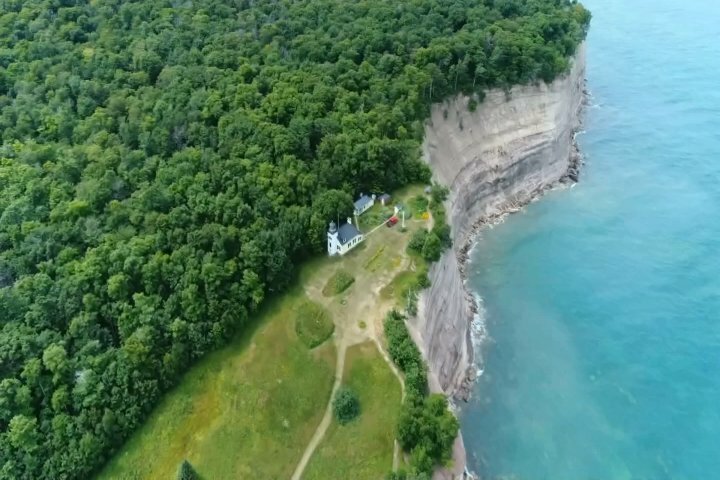 It sits on a 200 foot cliff above Lake Superior. It did not look the way it does today. “The windows were broken, the kitchen floor was collapsing, the ceilings were collapsing. It was a mess, but it was the place I wanted,” explained Loren. He bought it in 1972 and the real work was about to begin. Imagine trying to get supplies to a place that, at the time, had no roads. “This was the hardest thing I ever did in my life, there were moments where I almost gave up. It was a labor of love,” said Loren. After two years of back breaking work, Loren and his wife, Pat, had their place of solitude. He had the perfect place to write books. One of those books is the loved “A Face in the Rock.” It’s the story about a Grand Island Ojibwa native named “Powers of the Air.” They’ve lived there every summer, and sometimes fall, for over four decades. Love isn’t the problem. Now, time is. Loren needs another light keeper. Loren has been trying to work with the Marquette Regional History Center to take his lighthouse.